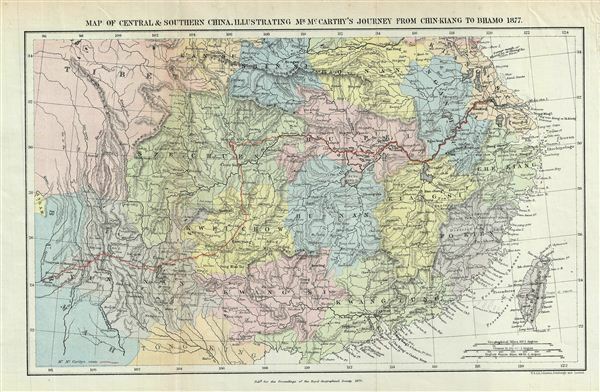 Map of Central & Southern China, Illustrating Mr. McCarth's Journey from Chin-Kiang to Bhamo 1877. This is a fine example of the 1879 Johnston map of central and southern China. Illustrating the journeys of the missionary John McCarthy from Chin-Kiang to Bhamo in 1877, Johnsont's map covers all of China from the borders with Burma and Tibet to Formosa. Several tea producing areas, including Kiang-Si as 'Tea Country,' Che-Kiang as 'Green Tea Country,' and Fo-Kien as 'Black Tea District' are noted. The map also notes the old course of the Whang-ho River (Yellow River) through Kiang-Su. Various towns, cities, rivers and other topographical details are also noted and is color coded according to provinces. Hong Kong and Cow-loon are noted as British territories. This map was drawn by A. K. Johnston and published by e. Stanford as part of the 1879 Proceedings of the Royal Geographical Society and Monthly Record of Geography.